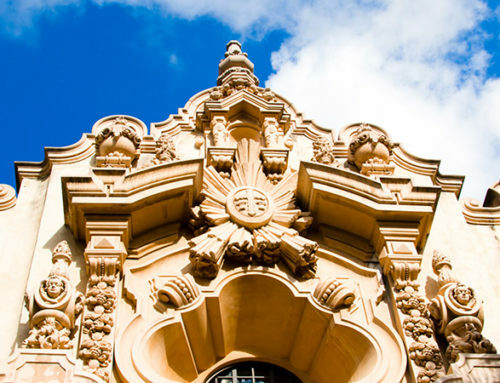 Obfuscated beneath the surface of Santa Fe lies a furtive secret society—a shadowy cabal that stands sentinel over a hidden trail of esoteric treasures. No wait, nevermind. 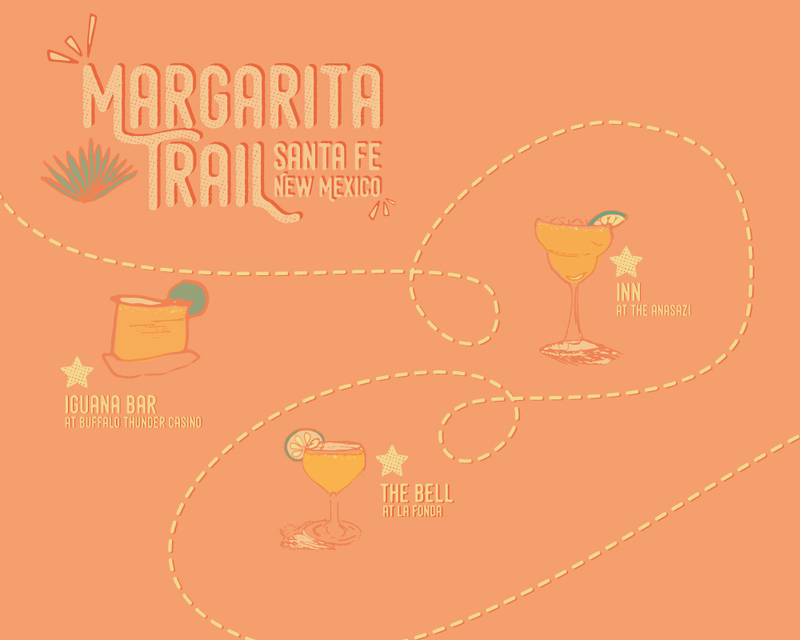 It is just the Margarita Trail—a fantastic, alcoholic, and flavorful tour of some of the finest Margaritas in the world. This self-guided, salt-rimmed tour takes thirsty participants to 31 participating bars and restaurants where they can try special concoctions and collect stamps to unlock special rewards. 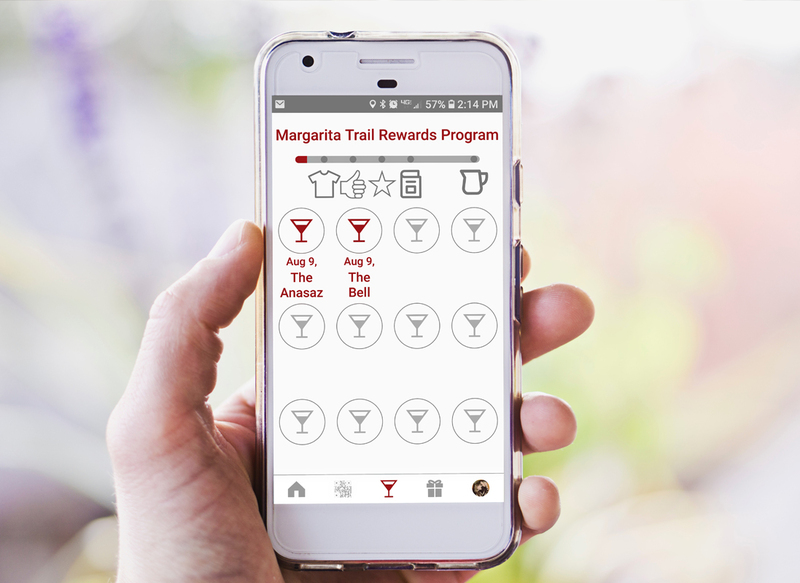 Starting the tour is as simple as purchasing a Trail Passport, which can be done via TOURISM Santa Fe Visitors Centers, directly from any participating establishment, or by downloading the paid Margarita Trail Passport app from either the Apple or Google app stores. Once you have your passport and included map, you are free to head out and sample any of the special Margaritas scattered across town. At each stop, you can collect a physical or digital stamp that will qualify you for membership in the Margarita Society (which conveys additional benefits), signed copies of The Great Margarita Book, and a Margarita bartender kit. You can only collect two stampers per day (drink responsibly! ), but you are invited to come back to the tour as often as you like to sample the next signature Margarita on your quest for cocktail conquest. A guide to our first stops. 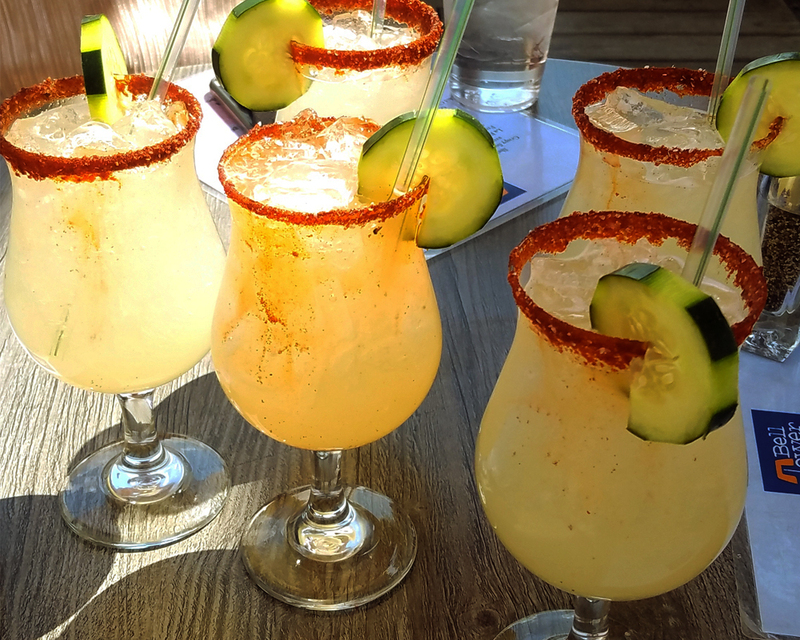 To help get you started, we stepped out on our own Margarita Trail experience. Keep reading to hear about our first three stops, an expedition headed by our own Christine Robertson—general manager of Fort Marcy Hotel Suite—and retold in her own words. It’s a big one, that’s for sure. My folks love to gamble and I discovered that one of their favorite casino bars was on the trail, so we did it on the fly. However… they gave us the wrong margarita. The app isn’t totally user friendly—lacking some basic instructions—and unfortunately our first bar did not know either. The guy that served us wasn’t the regular bartender, so we found out when we were already drinking that the ones he made us weren’t the right Margarita. Also, all the bars have cards that participants are supposed to scan, but we didn’t know that, and he didn’t know that, so we didn’t get “credit”. The Marg was good and very full, but it wasn’t the best experience on the trail. A wide selection. What’s your poison? This is a stunning hotel and restaurant, and the highlight of our trail so far. George—our bartender/server—was extremely helpful and a skilled mixologist. 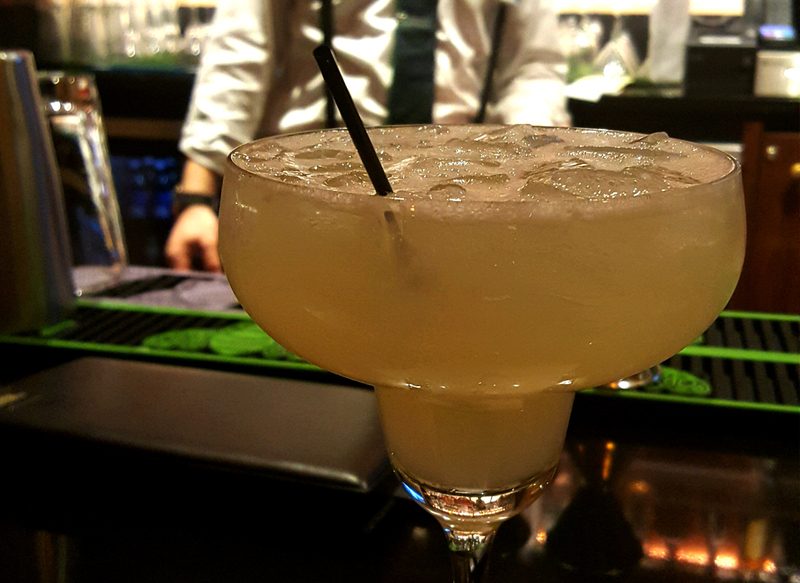 We grabbed a beautiful, high table in the lounge and enjoyed the official trail margarita: the “Sandia y Pepino” (silver tequila, Cointreau, watermelon, cucumber, and tajin lime salt). You can only have one during your stop, so we stayed and enjoyed a few of George’s other creations—including the Spicy Paloma and a Cucumber Mojito. Both were fantastic. 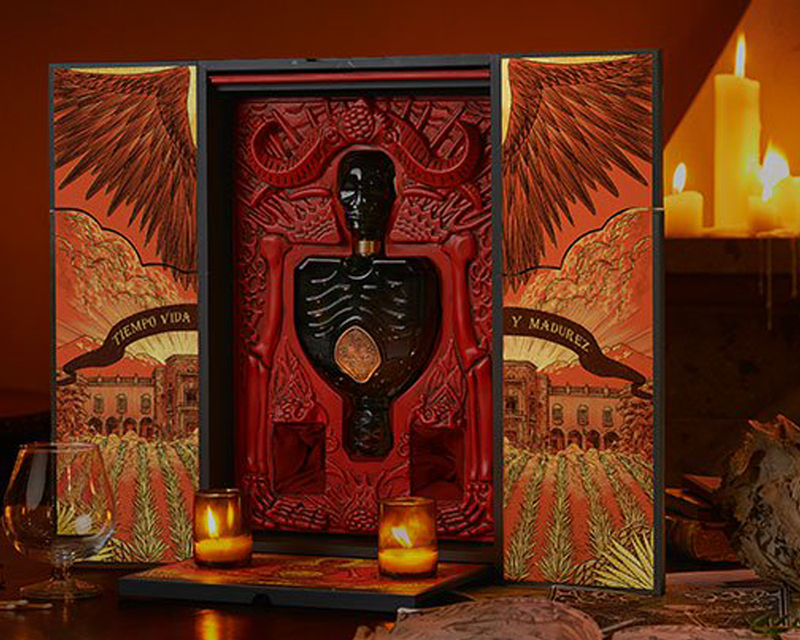 Designed by Guillermo Del Toro. We decided we would go back just to visit George. He gave us the lowdown on how everything worked and answered our questions about the Trail. We wished we had started here. 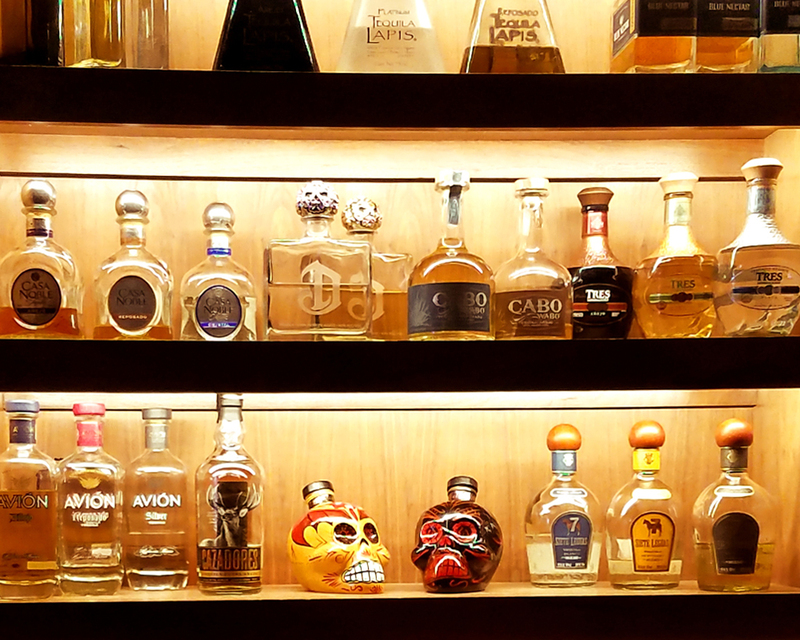 As I mentioned, this is a stunning room, and one of the highlights of that area was the tequila designed by Guillermo de Toro, which was the focal point of the tequila wall. They have a bar menu, so we ordered some chips & salsas while we were there. They were good as well. Our last stop of the day. This spot had super views of the city and a nice breeze. Our server here was austere in expression and could have made an excellent addition to the Queen’s Guard. We made a bet that whoever could make him smile didn’t have to pay the bill. Nevertheless, their margarita, the “Don Real Margarita” was very good (sauza hornitos reposada, anejo, gran marnier, and patron citronge). We also split a few quesadillas—veggie and chicken—and they were both good. The experience was great, and we would definitely come back for another round of drinks and quesadillas, but the Trail beckoned, and we moved on. While things got off to a rocky start, our intrepid pathfinders managed to overcome some initial confusion with the app and the process of completing the trail on their way to claiming their first two stamps, 40% of the way to their first prize. 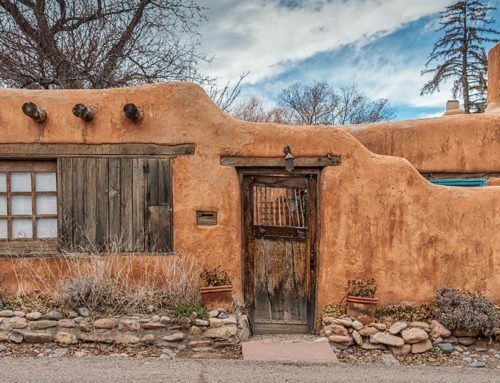 To find more information about the trail, visit the TOURISM Santa Fe page here, or go straight to the Apple App Store or the Google Play Store to grab the passport app. 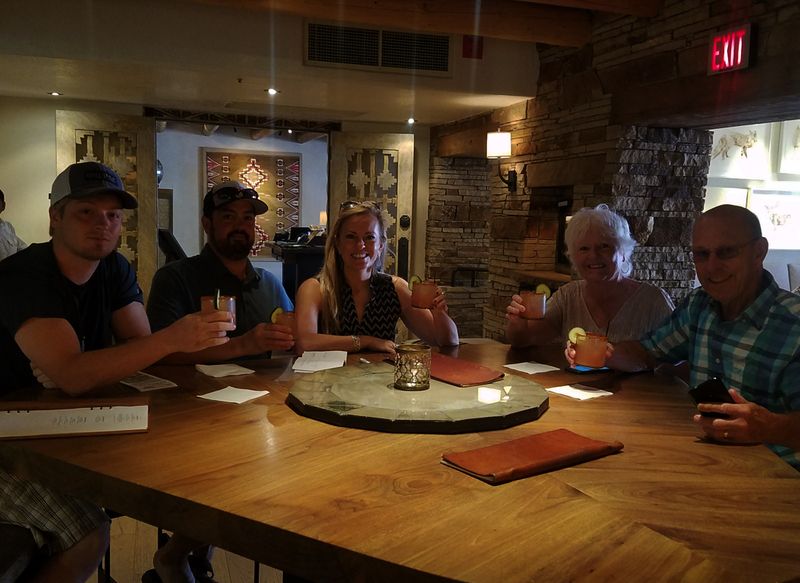 Make sure to share your favorite Margarita Trail pick, and stop by Fort Marcy Hotel Suites to recover from your evenings on the Trail.